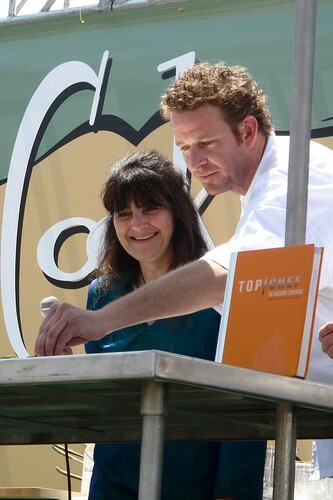 "Betty Fraser, Chris “CJ” Jacobsen, Antonia Lofaso & Stefan Richter, authors of Top Chef Quickfire Cookbook, with special guest judge Ruth Reichl, author of For You Mom, Finally and Tender at the Bone, among others"
If you weren't reading closely, or if you're a Top Chef fan, you might not have even realized that Ruth was going to be there. I suspect Ruth made an appearance because before she the restaurant critic of The New York Times and then editor-in-chief of Gourmet magazine, she was first the restaurant critic of The L.A. Times. They certainly did not make it seem like she was there to promote her newest book, Tender at the Bone. 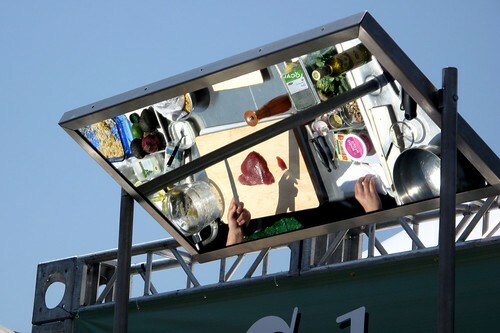 I also suspect most of the people filling the rows and rows of chairs in front of the Cooking Stage today were fans of Top Chef and not Ruth Reichl. Many of them didn't even know who she was. This suspicion was confirmed through a casual conversation with the girls who happened to be sitting next to me. One girl came to the Festival of Books specifically to have her Top Chef Quickfire Cookbook signed. No idea who Ruth was. Fine, so they're Top Chef fans. 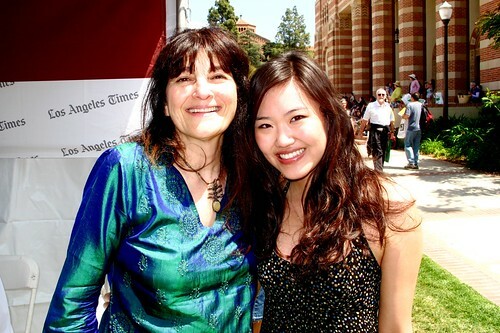 I am too, but I am also a Ruth Reichl fan. 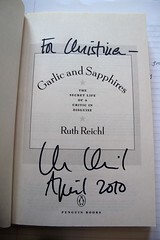 I recently started reading her books, starting with Garlic and Sapphires, and I have to say, I'm in love with them. Thus, what ensued on stage made me a little irritated. After a good 15 minutes of Top Chef trivia, the chefs participating in this makeshift quickfire were introduced. Ruth got a 5 minute introduction, after which she was positioned awkwardly on the tiny stage, behind three scrambling quickfiring chefs. I could barely see her. To make things worst, Stefan was the other "guest judge" and host for the event. 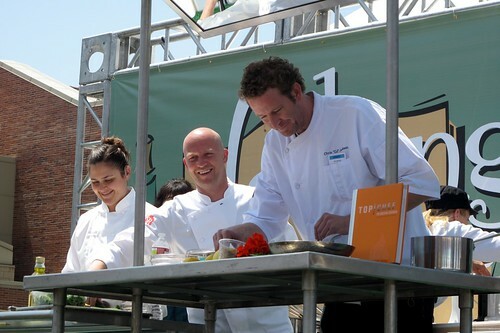 Anyone who's ever seen an episode of Top Chef that had Stefan in it knows how egotistical and slightly irritating he can be. Well, he's not much better in real life. Granted, it is entertaining at times, but when he repeatedly cut off Ruth's comments and remarks, it became just plain rude. He also made no effort to acknowledge her presence on stage. Finally, it got so awkward that Antonio had to speak up about how she only agreed to attend the event because she knew Ruth would be there, and what a great honor it would be to cook for her. Antonio was also the only one to mention anything about Ruth's career as a restaurant critic by providing a little anecdote about how restaurants in New York used to always be on the look out for her and how no one know what she looked like because of her disguises. However, when Ruth did get a word in she was great. Funny, yet elegant. She just seems so put-together and so graceful to me. I had to run back to my room, luckily my room is like 5 minutes away, to get my copy of Garlic and Sapphires for Ruth to sign. 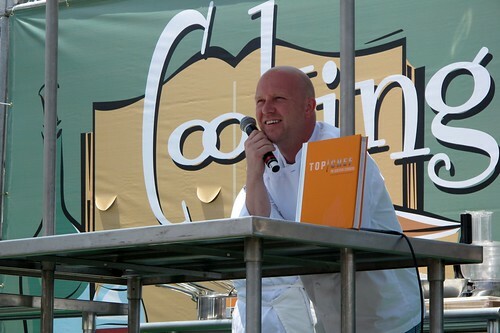 When I approached the signing table tent, there was a pretty long line of people waiting for to get their Top Chef Quickfire Cookbook signed. I asked where I could find Ruth Reichl. Just go to the other side of the tent they told me. There was no line for Ruth's signature. All the better for me. However, Ruth seemed unceremoniously wedged into a little corner of the table. When I asked to take a picture with her, she said she couldn't stand up, she was wedged in so tight. Of course, an exaggeration, but still. Really? 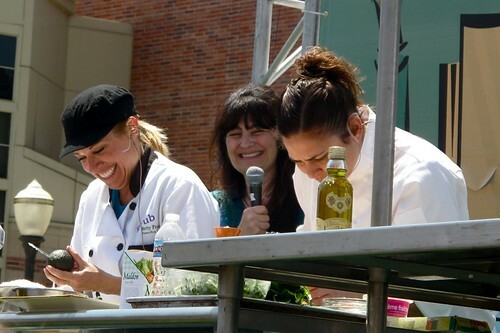 All the other Top Chef contestants had plenty of elbow room to do their signing. I understand this was billed as a Top Chef event. I'm just feeling a little miffed for her. I'm not sure why Ruth Reichl was even there. What does she have to do with Top Chef? She seemed more like an afterthought when she should've been the main attraction. Although, I'm glad I got the opportunity to see her in person. It made my stressful weekend a little more bearable :) And tomorrow...Alice Waters! jealous! 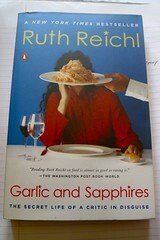 i LOVED Garlic and Sapphires and just the way she writes. thanks for sharing! Wait a minute, this is more important than Asset=Liabilities+Stockholder's Equity?